Enjoy downloading the Merry X-Mas 2017 Free Flyer Template created by Stockpsd! The Merry X-Mas 2017 Free Flyer Template was designed to promote your next Christmas Party and Club Event. This print ready flyer template includes a 300 dpi print ready CMYK file. All main elements are editable and customizable. You can edit the main text via text tool, the model image you can replace via smart object, right click edit smart object in your layer menu. The flyer is fully layered and organized to keep customization very simple! Fully Editable, you can modify everything very easy and quick. Changing the color style, pictures, Text. It is well organized in folders and layers. Holidays are almost there. Present your next Xmas Event or Party with this creative free flyer. 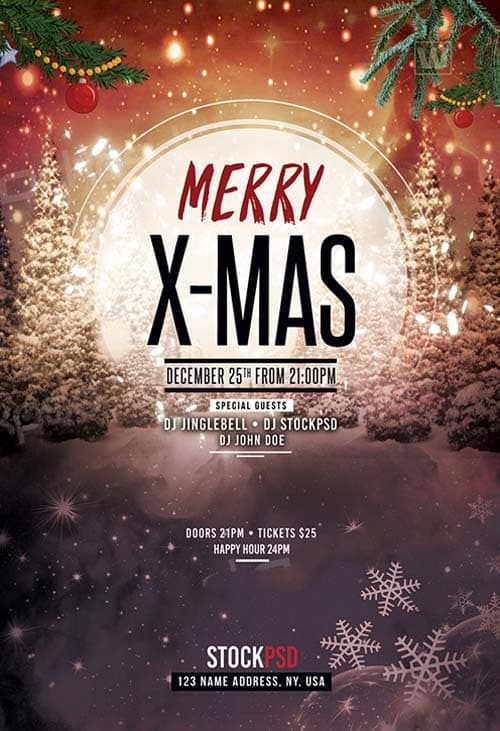 Merry X-Mas is a Free PSD Flyer Template. This PSD File is very easy to edit, change the color, text, shapes or other elements that you can easy add/delete. This flyer have also Alternative Colors which you can change the whole flyer template by just one-click ! X-Mas Party is a New Flyer Template with Holiday Feeling. It can be used for any type of event, x-mas gifts or party. This template is created more for Holidays and with Winter feeling. Flyer is very easy to customize and it is organized in groups included also help file to guide where to change colors & many more helpful information.